SATC members practice bayonet drills on the Quad. Photo Courtesy of the Corolla. The 1918 campus of the University of Alabama would be a strange sight for the modern observer. Familiar classroom buildings such as Morgan and Smith Halls would be present; however, the students filing out of them would be wearing strange, round brimmed caps and earth toned uniforms. The quad that now serves as a field of festivity and recreation was instead witness to the precision of military cadence and the spectacle of bayonet drills. The University of Alabama Reserve Officers’ Training Corps was established by War Department Bulletin on 4 December 1916 to train Officers in anticipation of American involvement in what was at the time referred to as “The Great European War.”1 On 6 April 1917, the war became an American conflict. The War Department’s scramble to raise a military force of over four million men and women defined the following months. The University began to produce military officers for the new army, and many of her alumni were commissioned as officers. SATC cadets practice grenade throwing on the Quad. Photo courtesy of of the Corolla. 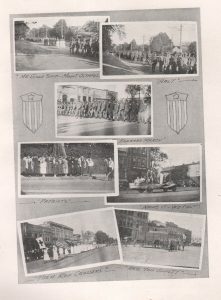 In the spring of 1918, the War Department called upon universities to launch special programs to train enlisted men in the “various mechanical arts.”3 Alabama saw itself as the perfect fit for the new program, citing ample engineering equipment and laboratories, and the recent establishment of the school of vocational education. A pair of military inspections of the campus declared Alabama’s facilities “excellent,” and, as such, one of the nation’s first Student Army Training Corps, or S.A.T.C. units, was established.4 On the morning of 16 May, 200 enlisted men reported to the campus to begin instruction in automobile mechanics using a pair of specially constructed garages in Comer Hall. The gymnasium was converted into a barracks.5 The troops took their meal in the normal mess hall, and the government and several private citizens in Tuscaloosa provided automobiles and trucks for student mechanics.6 The President’s report made very clear that the presence of the S.A.T.C. would not interfere with the normal operations of higher education at the University. Their commander had different ideas. Sometime around the establishment of the S.A.T.C. in 1918, a mysterious name appeared on the campus. Referred to in the Crimson White and Corolla only as “Major Ord,” this figure would soon find himself in University memory only as a vilified ghost. A search of congressional records on the promotion of officers identified “Major Ord” as Major Edward Otho Cresap Ord, II, U.S.A. Ord came from a family of military tradition, his father being the famed Major General Edward Ord, commander of the Army of the James during the Civil War and namesake of Fort Ord, California. 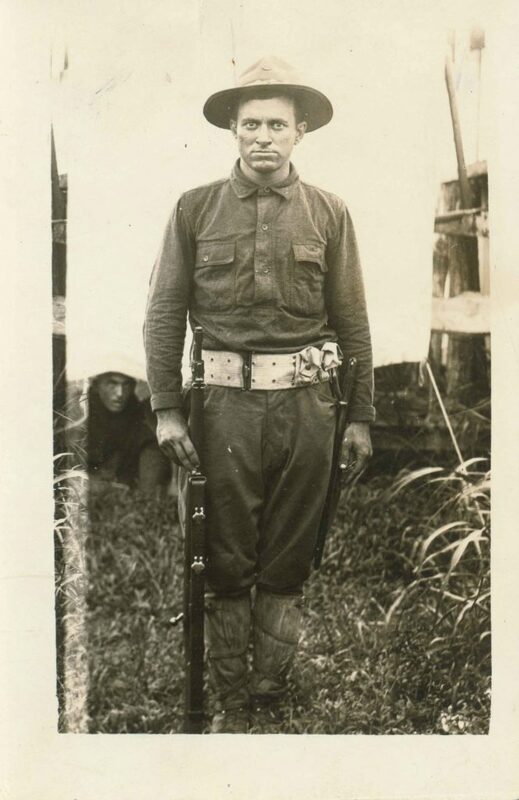 His brother was First Lieutenant Jules Ord, credited with starting the “spontaneous” charge of the Buffalo Soldiers up San Jaun Hill during the Spanish-American War.7 Major Ord’s son was Major General James Garesche “Garry” Ord, commander of the 28th Infantry Division and Chairman of the Joint Brazil-U.S. Defense Commission during WWII. Major Ord himself had extensive military experience with the 22nd Infantry Regiment and Seminole Indian Scouts during the Indian Campaign in Texas in 1880 and the Ghost Dancer revolts of 1891-1892. He contracted yellow fever in Cuba during the Spanish American War and participated in the Philippine Insurrections against the Moros. Medical complications forced his retirement from active service in 19038, although he would serve as a special police officer in San Francisco to assist with the recovery from the 18 April 1906 earthquake. In 1908, he took a position as a professor of military science at St. Matthew’s school in San Mateo, California. In 1915, he served as a military aide to the governor of Arizona. There he saw some degree of border service, preventing incursions by Pancho Villa and his banditos into Arizona. Ord once again slipped into retirement until the United States entered the Great War in 1917. The endorsements presented to the Senate in his promotion report point to Ord being a model military officer, a seasoned commander, and a son of military aristocracy. This is the exact type of figure that the University of Alabama would like to remember when commemorating her service to the nation in the First World War. However, in this case, the opposite is true. No available official University record mentions him, and he is notably absent from the portraits of military officers on campus in both the University R.O.T.C.’s Duco Library and Corolla issues from the era. In fact, the only mentions of Ord are negative, and he apparently gave birth to a neologism, “Ordism,” to describe his administration on campus, where he seemed to frequently overstep his authority. SATC cadets in formation on the UA Quad. Photo courtesy of the Corolla. SATC cadet color bearers on the Quad, near the current location of Gorgas Library. Photo courtesy of the Corolla. In response to Ord’s assault on campus life, the non-S.A.T.C. students filed a formal petition to the University administration, protesting to the forced labor, compulsory study and hygiene regulations, and inferior quality food compared to what was being served to the troops on campus. The students cited that they were in no way associated with the Military, and paid for tuition, room, and board, therefore believing themselves exempt from military discipline.12 It would seem the president’s promise that the military would not interfere with the normal operations of the institution was not kept. The question regarding Ord’s rise to power leaves more puzzles than answers. During his time here, it would appear that Colonel Brown was still present and in command of the R.O.T.C. cadets. Though Colonel Brown would not have direct authority over Major Ord despite outranking him, Brown could have brought Ord’s overextensions to his chain of command, potentially assuaging some of the suffering of the University’s remaining civilians. There also seemed to be no action from the University administration on the matter. The void of records regarding him is remarkable, and raises the question as to whether there may be some nefarious cause. For a man that had such influence on the campus, it would seem logical that there would be at least some official mention of him in the institutional memory of the University. Yet aside from Crimson White articles, the only references uncovered are poems written in jest, found in the 1919 Corolla. 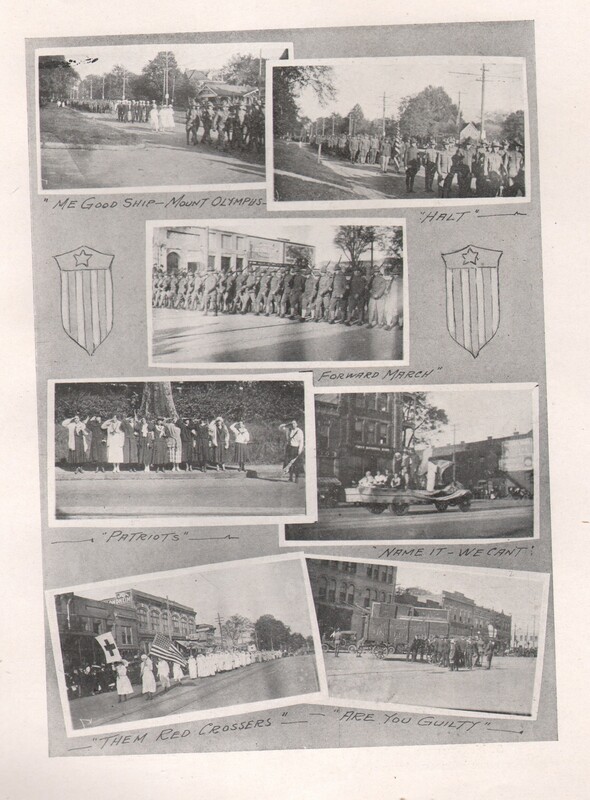 Photo collage from the Corolla, showing SATC cadets and other military preparedness activities about campus and town. Photo courtesy of the Corolla. Despite Major Ord’s iron fist, the resilience and patriotism of the University’s students cannot be ignored. While it would be understandable for some students to harbor negative feelings towards the military, what happened instead is remarkable. Nested in the Crimson White columns, in between the various stories of forced labor and disputes brought about by Major Ord, is a call for the “Alabama Spirit Once More,” asking for donations to support the needs of the troops in camps across the country and fighting overseas with the American Expeditionary Forces.13 2,254 students and alumni served in the Great War, and twenty-six men and women from the University gave their lives, a staggering 3% of the student body during the period. The memory of the war, though long forgotten by the average student moving about the campus, is omnipresent. As University Boulevard cuts through the heart of campus, it is lined by oak trees. A small, oft ignored marker just west of Denny Chimes bears forty-five names, one for each tree, memorializing the residents of Tuscaloosa who died or were killed during the war. Jones Hall, Foster Auditorium, and the Gorgas House bear the names of veterans of the conflict. Stone and bronze markers stand silent testament to the sacrifice and triumph of the era. However, it is hoped that the current World War I Centennial Commemoration projects on campus will serve to connect the University of today to the one of a century ago. The Veteran and Military Affairs Office on the third floor of Houser Hall is currently presenting “Lafayette, We Are Here: America Enters the First World War” in their lounge, an exhibition partnership with UA Museums produced by interns from the Department of History. UA Museums is also presenting “William C. Gorgas and the Great War” on the first floor of the Gorgas House Museum. UA Libraries currently has a WWI centennial display in the foyer of Gorgas Library, and a display of sheet music from the era in the lobby of the W. S. Hoole Special Collections Library in Mary Harmon Bryant Hall. The Veteran and Military Affairs Office is also publishing a monthly blog on social media, written by the author, following the war and University month-by-month until the end of the centennial period on 11 November 2018. Hopefully, more exhibits and articles are to come, and this pivotal period in University and world history will continue to capture the imagination of modern students and visitors. 1. Order of Battle of the United States Land Forces in the World War: Zone of the Interior, CMH Publication 23-4, United States Army; Crimson White dated 12 Oct 1916 mentions arrival of Captain Minnegerode and commencement of organization. 2. President’s Report, Minutes of the University of Alabama Board of Trustees, 27 May 1918. 5. The “Gymnasium” referred to is most likely present-day Little Hall. 8. Senate Report No. 2423, 23 April 1904. 9. “Societies Killed by Authorities” Crimson White, 6 November 1918. 10. “Non-SALC [sic] Men Forced to Perform Menial Tasks, Clean Basements of Houses” Crimson White, 6 November 1918. 11. Suzanne Rau Wolfe, The University of Alabama, a Pictorial History, University of Alabama Press, 1983, pg. 139; Wolfe does not list her source for this account, and a search did not produce the letter from the Crimson White or any evidence of the incident. Nonetheless, it is believable that it occurred. If it did not, the account further reinforces the negative perception of the Major in the University’s memory. 12. “Non-S.A.T.C. Men Protest Strongly” Crimson White, 6 November 1918. 13. Crimson White, 6 November 1918. As part of my research for the Gorgas House’s upcoming feature on the centennial of American entry into the First World War, I am exploring the actions of Alabamians that fought in the Great War from 1917-1918. Many of these Alabamians were organized under the 167th Infantry Regiment of the 42nd Infantry Division (aka the “Rainbow Division.” So dubbed by Douglass MacArthur to reflect the nationwide origins of her regiments). Within this regiment served my own ancestor, Pvt. Clarence Lee Culver, of Elba, Alabama. Initially volunteering for service with the Alabama national guard, Culver went on to serve along the Mexican border under General John J. “Black Jack” Pershing, before being called to national service as a member of Company H, 167th Infantry Regiment. Upon arriving in France, the 167th participated in five major campaigns along the northern part of the Western Front (the 42nd Division’s sector stretched from Reims in the North to Baccarat in the south). 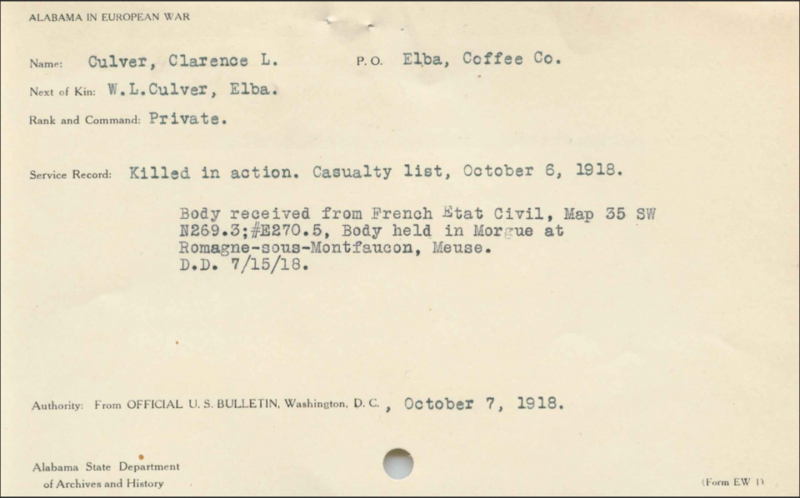 Culver was killed on July 15, 1918, near Châlons-en-Champagne, during the Champagne-Marne Defensive to repel the German “truce offensive,” the last major German conquest of the war. Such a personal connection to a distant event makes the work very meaningful and enjoyable to me, and provides an important human perspective to a discipline of history often focused on units and strategies. The experience of the everyday soldier are vital to the story, and I look forward to being able to share their memory in the exhibit. Photos courtesy of the Alabama Department of Archives and History’s World War I Gold Star Database.